Preheat the oven to 200°C/Gas 6. First, prepare the herb butter. Put the butter into a large bowl and season with salt and pepper. Add the olive oil and mix well. Add the lemon zest and juice, crushed garlic and chopped parsley. Mix well to combine. Remove the giblets from the cavity and reserve for making the gravy Season the cavity well with salt and pepper and then stuff with the onions, lemons, garlic halves and 2 bay leaves. Place the bird in a large roasting tray, breast side up. With your hand, loosen the skin on the breast of the bird from both ends of the bird so that you can stuff the flavoured butter underneath it. Repeat with the skin on the legs - from the lower side of the breast feel your way under the skin and out towards the leg, loosening the gap. Stuff half the butter mix into the opened spaces under the skin. From the outside of the skin, gently massage the butter around the breasts so it is evenly covered. Finally insert the remaining bay leaves under the skin of the breasts. Spread the rest of the butter all over the skin of the bird. Season well with salt and pepper, then drizzle with a little olive oil. (If preparing a day ahead, cover the turkey with foil and refrigerate). Roast in the hot oven for 10-15 minutes. Take the turkey out of the oven, baste with the pan juices and lay the streaky bacon rashers over the breast to keep the turkey moist. Reduce the temperature to 160°C/Gas 3 and cook for about 21/2 hours (calculating at 30 minutes per kg), basting occasionally. To test that your turkey is cooked, skewer the thickest part of the leg and check that the juices are running clear, rather than pink. 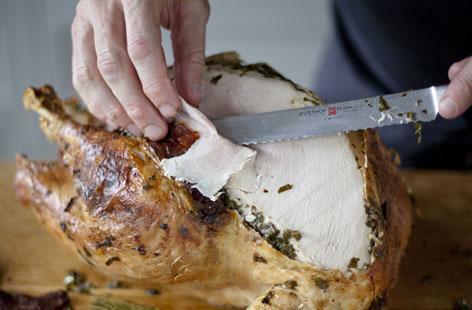 (As oven temperatures and turkey shapes and sizes vary, it is crucial to check your turkey about 30 minutes before the calculated roasting time. If the juices are pink, roast for another 15 minutes and check again. Repeat as necessary until the turkey is cooked.). Transfer the turkey to a warmed platter and remove the parson’s nose, wings and tips of the drumsticks; reserve these for the cider and walnut gravy. Leave the turkey to rest in a warm place for at least 45 minutes and make the cider and walnut gravy in the meantime. Remove the bay leaves from under the skin before carving. Serve the turkey with the piping hot gravy, stuffing and accompaniments.